You are here: Home / Galaxy Note 5 How-to Guide / How to use Galaxy Note 5 screen off memo? Galaxy Note 5 screen off memo lets you create action memos without turning on the screen. 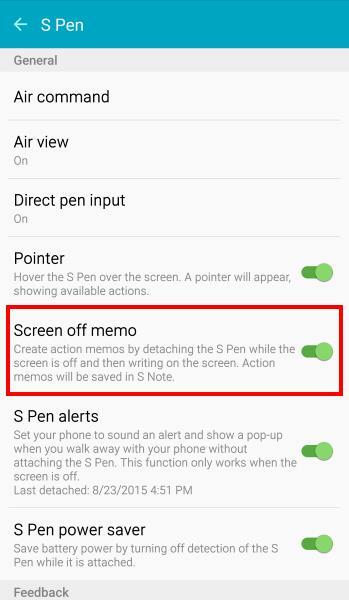 This guide shows you how to use Galaxy Note 5 screen off memo and how to open them as action memos in S Note app. Samsung Galaxy Note 5 has several new features. One of the most useful S Pen feature is Galaxy Note 5 screen off memo, which allows you to write on a locked screen like on a blackboard using your S Pen without unlocking the phone. This guide tries to explain to you what is Galaxy Note 5 screen off memo, and how to use Galaxy Note 5 screen off memo. What is Galaxy Note 5 screen off memo? Galaxy Note 5 screen off memo is a special S Pen feature introduced in Galaxy Note 5. You can quickly create memos by writing on the screen with S Pen without turning on it. In other words, when the screen is still locked and black, you can use S Pen to write on the screen like on a blackboard. You can edit or erase what you wrote. Then save what you wrote as an action memo. the screen is still locked. Galaxy Note 5 screen turns into a blackboard and your S Pen is the chalk. you cannot use your finger. you have a eraser to remove part or all of what you have written. you can choose to delete without saving. you can choose to save what you have written as an action memo. You probably should not worry about too much battery usage, because the super AMOLED screen on Galaxy Note 5 does not consume battery for black color (the black pixels is not lit up). To use Galaxy Note 5 screen off memo, you can follow these steps. By default, Galaxy Note 5 screen off memo is turned off. To use Galaxy Note 5 screen off memo, you need enable it. In Settings—S Pen, you can enable screen off memo as shown below. Once Galaxy Note 5 screen off memo is enabled, the switch will be shown as green as shown below (if you are using the default Galaxy Note 5 theme). Please note, you need enable Galaxy Note 5 screen off memo only once. The feature will be available until you manually disable it. Galaxy Note 5 screen off memo only works when the screen is off (black). By default, you can press the power button to turn off the screen and lock the screen. 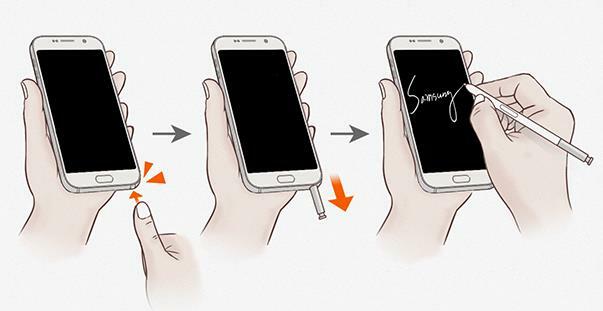 When the screen is off, you can detach S Pen from Galaxy Note 5. Please do NOT touch home button or power button to turn on screen. To detach Galaxy S5 S Pen, you need press the end of the S Pen to disengage it. Then pull the S Pen out of the S Pen slot as shown below..
You may check this guide to detach and store S Pen on Galaxy Note 5. Once S Pen is detached from Galaxy Note 5, and if the screen is off, you screen will now become a blackboard as shown below. S Pen mode. You can use S Pen to write on the screen, just like a white chalk on a blackboard. Eraser mode. In this mode, you are make corrections. You can erase any strokes. Please note, the eraser erases one stroke at one time. It is NOT based on pixels. Discard the memo. You can tap this button to discard the memo and turn on the screen. Save the memo. Tap this button to save the memo and turn on the screen. By default, you are in S Pen mode. You can write straightaway after pulling out the S Pen as shown below. After finishing your memo, tap SAVE button to save it as an action memo in S Note as shown below. Step 5 (optional): Edit Galaxy Note 5 screen off memo in S Note. 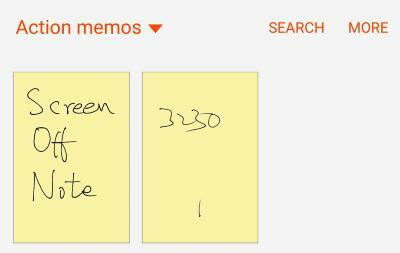 Once you save the Galaxy Note 5 screen off memo, the memo will be saved as an action memo in S Note (see above). You can edit it further in S Note app later. When the memo is saved, you will also get a notification message in the notification panel as shown below. 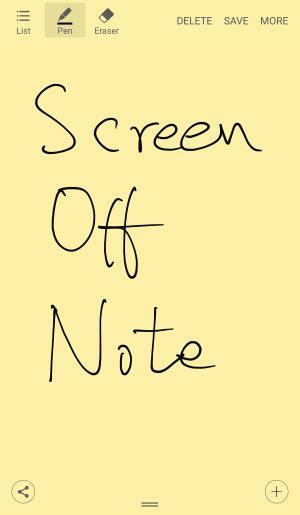 How to access Galaxy Note 5 screen off memo in S Note app? All memos created and saved in Galaxy Note 5 screen off memo are saved as action memos in Galaxy Note 5. You need start S Note app to access action memos. Once S Note starts, the default view is “All” as shown below. You can tap ALL button as shown below to switch to action memos as shown below. You can edit and link an action to the memo by tapping MORE button after opening the memo. 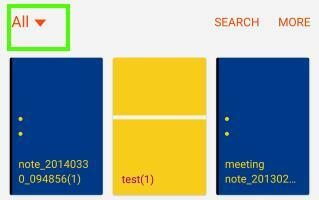 The detailed usage of action memos will be covered in this guide (coming soon!!). Can you use Galaxy Note 5 screen off memo now? If you have any questions on Galaxy Note 5 screen off memo, or encounter any problems when using Galaxy Note 5 screen off memo, please let us know in the comment box below. During screen off memo, how can i continue writing to the next page? On Note 9, screen off memo can have multiple pages. On Note 5, no, the screen-off memo is limited to one page. My note 5 is not detecting the detachment of the s pen. What can I do ?? Did you check settings — S Pen? yes, screen off memo works with screen protector. I have an android 7.0 tablet and also my Note 7 would save off screen memo to Samsung Notes which in turn syncs to Samsung cloud so I can view on with device. S Note is going away so now that I am back on the Note 5 for awhile I don’t want my off screen memo to save to S Note but to Samsung Notes. Fusrating. There are no easy solutions. Sansung Note was integrated to Note 7, not Note 5. Recently I am facing a problem usingScreen Off Memo. Problem: while using off screen memo on that time after using few approximate 5 seconds my screen turns off even I am writing. Then again I have to press the power button to write. So basically I have to press continously to write in Off screen memo. Looking forward response from you. It is normal. As I know, screen off memo is designed for a quick note, not a normal app. How do I change the “save as” name of action memo? It’d be nice to be able to save under name instead of the generic name. 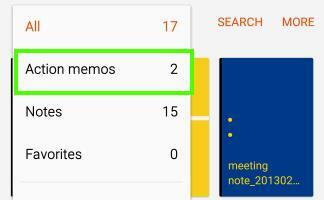 You can rename the memos in SNote app just like other notes. Hi there, I would really like this screen off memo feature to have my to-do list during the day… But everytime I pull out the S pen with the screen locked, of course, a NEW screen off memo appears. There are some S Pen apps. But most of them don’t work in Marshmallow. Following a suggestion from somebody at XDA developers, I am now using Note Buddy to start the INKredible app when removing the stylus with a locked screen. Downside is that I had to disable the automatic start of AirCommand when the phone is unlocked (which can still be started with the push of the button on the pen). This is currently about as good as it gets for me I guess, it works on Marshmallow! Is there a way to keep the screen locked on a Samsung Galaxy Note 4 running Android 6.0 whenever the S-Pen is removed? It seems absolutely useless if the phone gets unlocked by simply removing the pen and writing a note on the screen then saving or deleting a massage??? You can disabled S Pen detection in S Pen settings. I want to take more than one note but I have to put back the pen. Isn’t this weird? Screen off memo is not designed for that usage. it is better to use normal S Note if you need take a few notes. What’s you lock screen security settings? If it is none, change it to swipe. If the phone screen is on, and you pull out the S Pen, what do you get? Can you change the color you are writing in on the screen off memo or is white the only option? No, you cannot change the color. When you are in screen off mode, you can find two icons in the top right. Tap the first one (pen) , you can find the options to adjust the thickness of the strokes. The second one is for erasing. You can only check action memos when phones is unlocked. 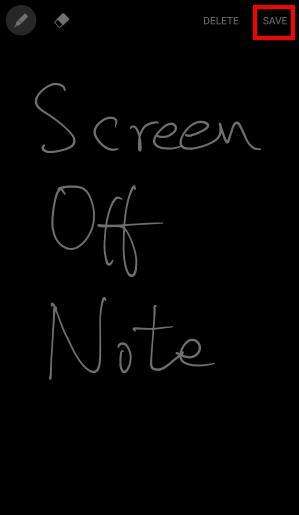 Screen off memo for you to create action memos when phone is locked and screen is off. It’s not for you to check action memos. Does the screen off memo work when encrypted & fingerprint locked ?? Yes, actually the screen must be off before you pull out the S Pen. Does your note 5 detect it when you move the s pen out of the slot? Then you should return the phone if the s pen is not working at all. I have no problem writing on the screen off memo, however the eraser, delete and save buttons are absolutely unresponsive when I touch them with my pen. It’s so weird. you can also tap the buttons with your finger. But you cannot write with fingers. I am experiencing the same problem with my note 5. Did you try it with your finger? Yes, none of the options available on the top bar works(eraser, save, discard) .. Whereas there is no problem at all in writing using the spen. Earlier the bar used to work fine. If the screen is on, when you pull out the s pen, do you get air command automatically? 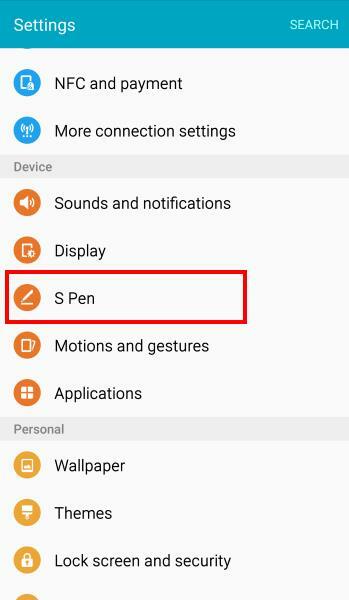 What’s the setting of detachment option under settings – s pen? If your note 5 cannot detect it when the s pen is removed or inserted , then you need visit Samsung service center to check the hardware. It turns out that inserting the S-Pen in wrong direction breaks phone’s S-pen detection ability and it needs to be repaired. Looks like my fault but indeed it is a design flaw. So AT&T protection plan offers to replace the phone with a refurbished one, and Samsung offers a free repair. In both cases I need to back up everything and survive without a phone around a week. Yes, it’s a design flaw. There are no warnings when insert the s pen in wrong direction. Help! My note 5 cant detect if the s pen has been removed or not. It always expects that the s pen is still attached so i cant use screen of memo. What should i do? If your note 5 cannot detect it when s pen is removed from the s pen slot, you should visit Samsung service center to check the hardware. Can your phone detect it when you remove the s pen from the slot? As explained to the guide, you need pull out s pen when screen is off. Th sequence is to open the flip case first, then pull out S Pen. Has anyone been able to write on the screen with a screen protector? I can’t use “memo off” notes with the screen protector. Screen protector should not be an issue. I used a tempered glass screen protector and there are no issues to use screen off memo. Can you use S Pen normally for other features? Yes and I did get it to work, not sure if I was writing at a bad angle or didn’t wait the two seconds it takes for the s screen to appear. Thanks, this is one of the best features. Make sure screen is not on, then pull out of the S Pen. The s note app note backgrounds are in color no white background. very strange! Action memo is not a normal S Note. It is supposed to stick on the screen to alert you. For normal S Note, you can always tap MORE to set background color as white when you are in editing mode of the note. I’m absolutely loving my SNote5. It’s amazing. The ability to write a note without having to unlock my phone is gold. I hate the Galaxy note5! The off screen memo writing is so fine and light it’s hard to read what you write! The notes features are all colored sticky notes ( gross!) I like a clean white background to write notes. I hate it. I’ve had it one day. Hope to be able to return it because of the colored sticky notes. Did you use screen protector? The writing should be clear enough for most users. The black background is to save battery. If you need white background, you can always use S Note app and choose whatever background you want for your notes. It’s not necessary to stick the screen off notes. You can remove it from home the screen. They are just normal action notes.